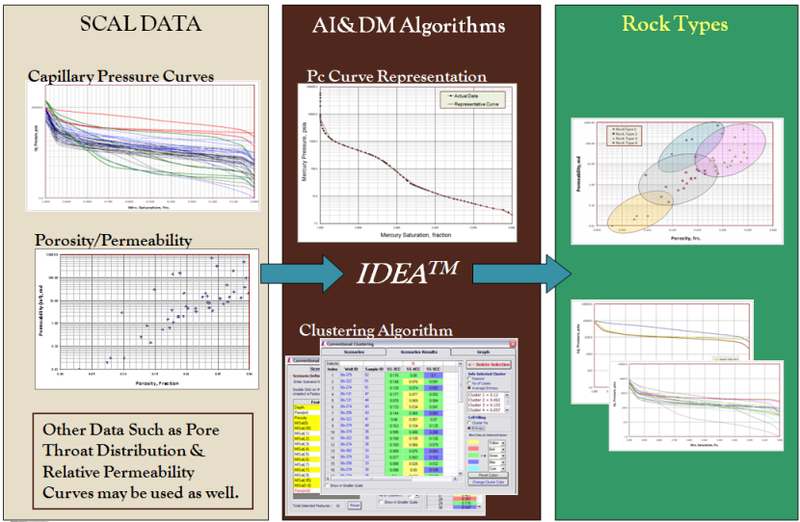 The above workflow represent the process through which MICP and other data can be used in order to generate Rock Types. Curve Representation using Intelligent Compression Technology. 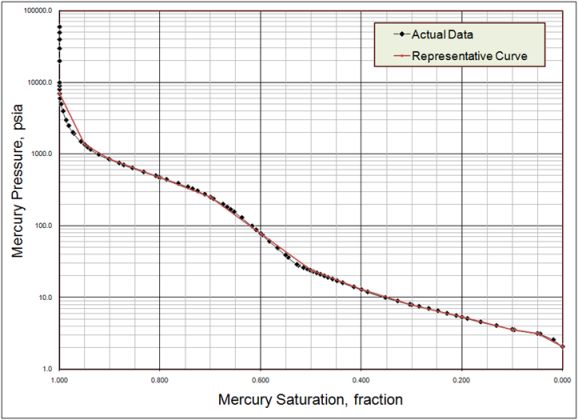 Must accurately reproduce the original Capillary Pressure and Relative Permeability Curves. 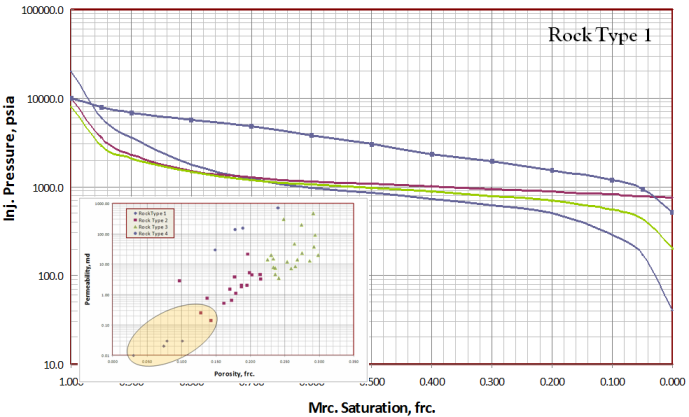 ISI's curve representation algorithms reproduces Pc and Relative Permeability curves with accuracy. 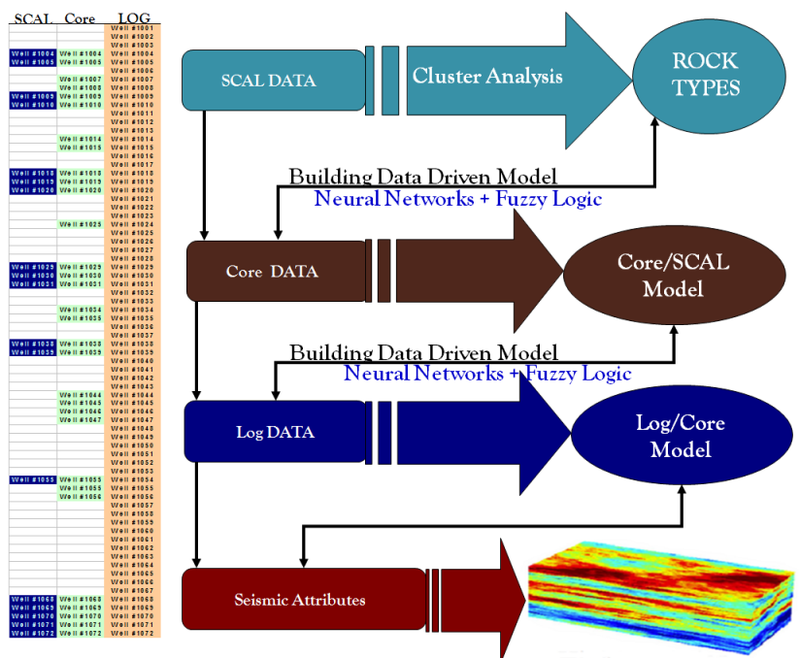 Rock Typing with State-of-the-Art Classification Algorithms, using Advance AI&DM Techniques (Self Organizing, Reinforced and Supervised Cluster Analysis ). 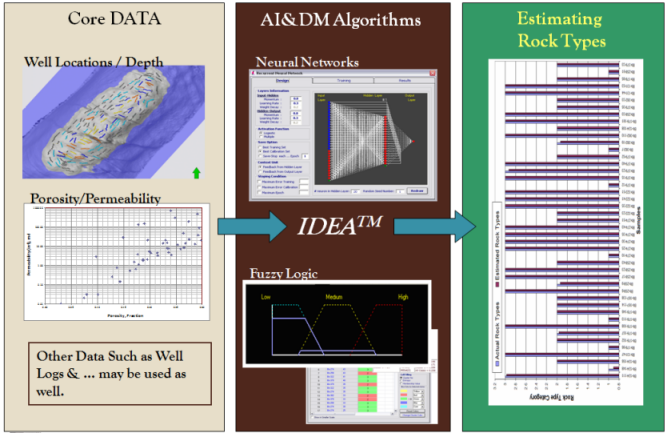 Self Organizing Cluster Analysis: Let IDEA Select the Rock Types. 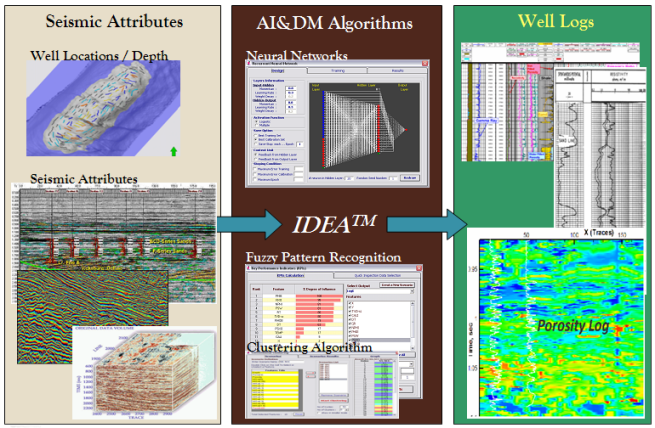 Reinforced Cluster Analysis: Domain Expert Observes and Influences IDEA's Rock Type Selection. 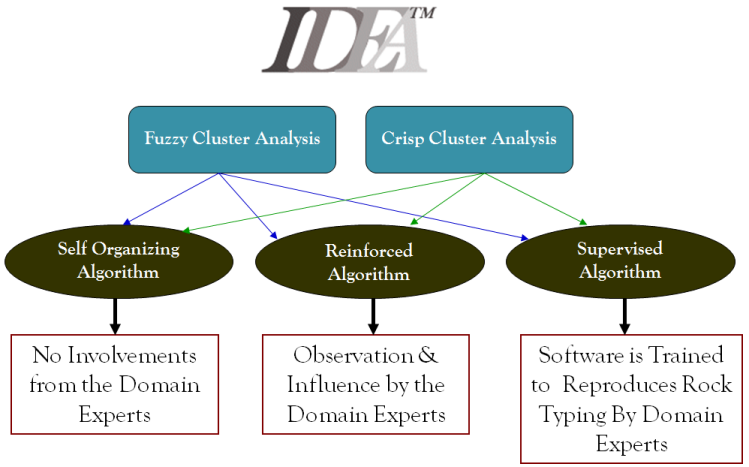 Supervised Cluster Analysis: IDEA is trained to reproduce Domain Expert's Rock Type Selections. Crisp Cluster Analysis: Rock Types do not overlap. Fuzzy Cluster Analysis: Overlapping Rock Types. ISI's workflow allows overlapping and non-overlapping Rock Types. An overview of techniques offered by ISI as Rock Typing workflow. 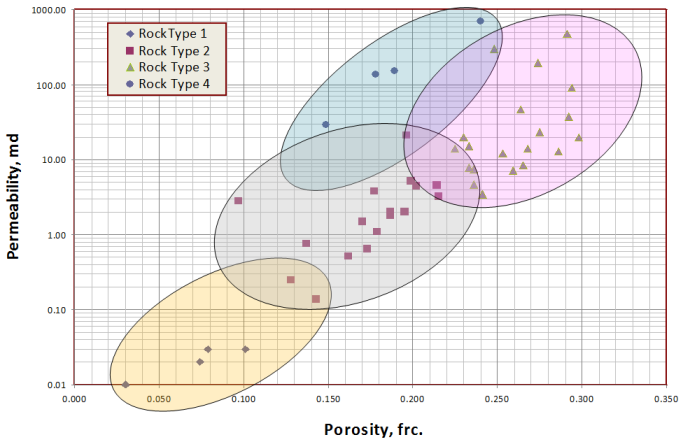 Overlapping Rock Types in a Porosity-Permeability cross plot. A naturally fractured carbonate reservoir. Capillary Pressure curves for Rock Type Number 1. Capillary Pressure curves for Rock Type Number 2. Capillary Pressure curves for Rock Type Number 3. Capillary Pressure curves for Rock Type Number 4. 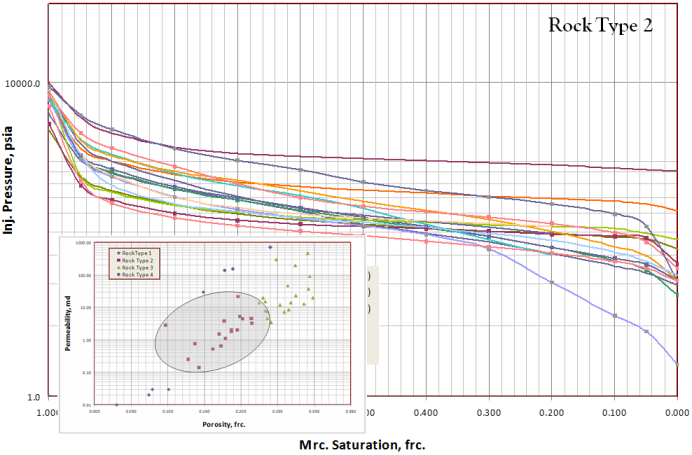 The above workflow represent the process through which Rock Types are estimated for wells that have core data (porosity and permeability) but not SCAL data. 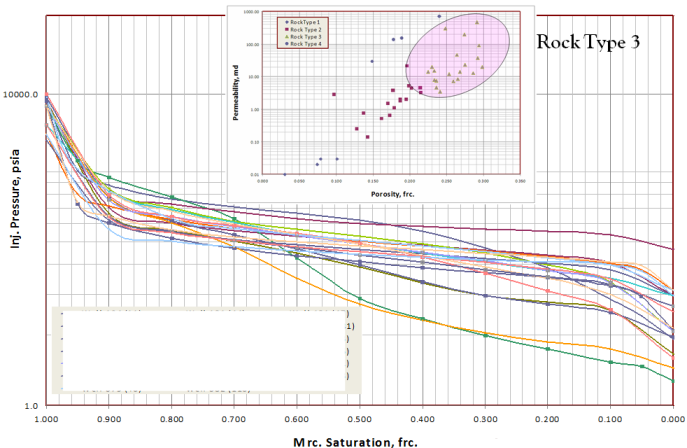 Using ISI's workflow shown above, all available information such as Depth, Latitude, Longitude, Porosity and Permeability from cored wells are used along with some relevant log data in order to estimating Rock Types. 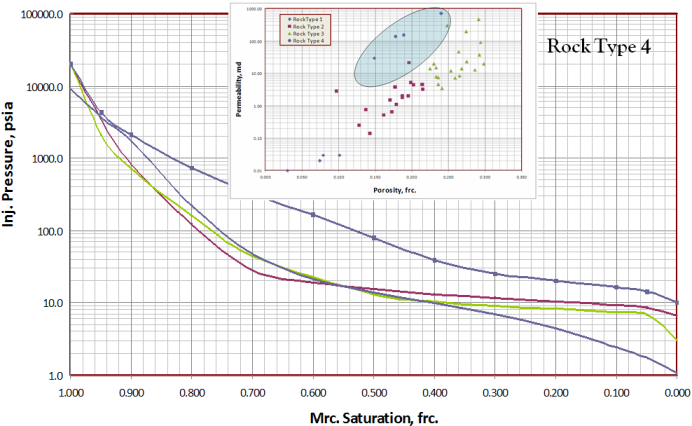 The above workflow represent the process through which core-porosity and core-permeability values are estimated for wells that have log data (Gamma Ray, Density, Sonic, SP, Resistivity ...) but not core data. 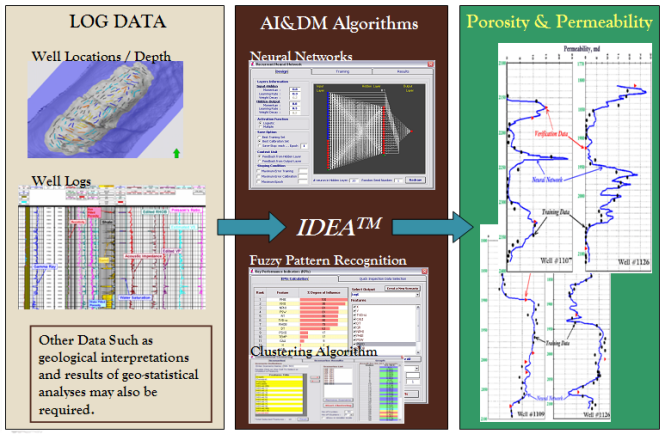 Using ISI's workflow shown above, all available information such as Depth, Latitude, Longitude, log data (Gamma Ray, Density, Sonic, SP, Resistivity ...) from logged wells are used along with some relevant geostatistical data in order to estimating Porosity and Permeability. The above workflow represent the process through which well logs such as Gamma Ray, Density, Sonic, SP and Resistivity are estimated for 3D seismic attributes. Using ISI's workflow shown above, all available information such as Depth, Latitude, Longitude, and 3D seismic attributes are used along with some relevant geostatistical data in order to	estimate well logs for all locations in the reservoir. This workflow lets you log a well, before drilling it.